an exhibition by lize mogel. 2 – in 2007 russia uses a deep-sea submersible to plant a flag on the sea floor underneath the north pole symbolically claiming the territory from there to its shores. 3 – documents from united nations convention on the law of the sea. the translation of the spherical world onto the flat plane of a map is a mathematical problem; the translation of the political world into a map is an ideological problem. how does one represent the world in a way that does not show dominance? something or someone is always on the top or at the center. 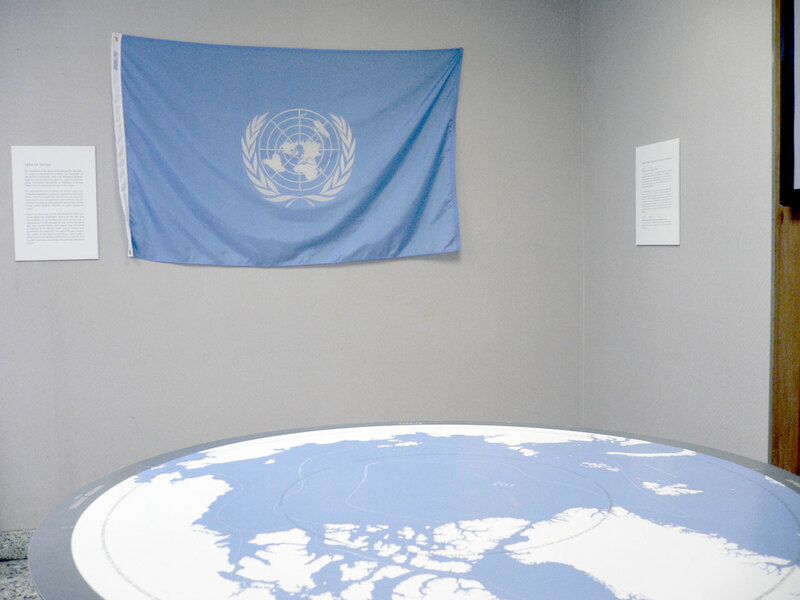 the united nations emblem is a world map centered on the north pole. the continents are not divided by national boundaries, thus geopolitical relationships are not pictured. this map is purely symbolic, representing nations united under common interests, all parts considered equal. 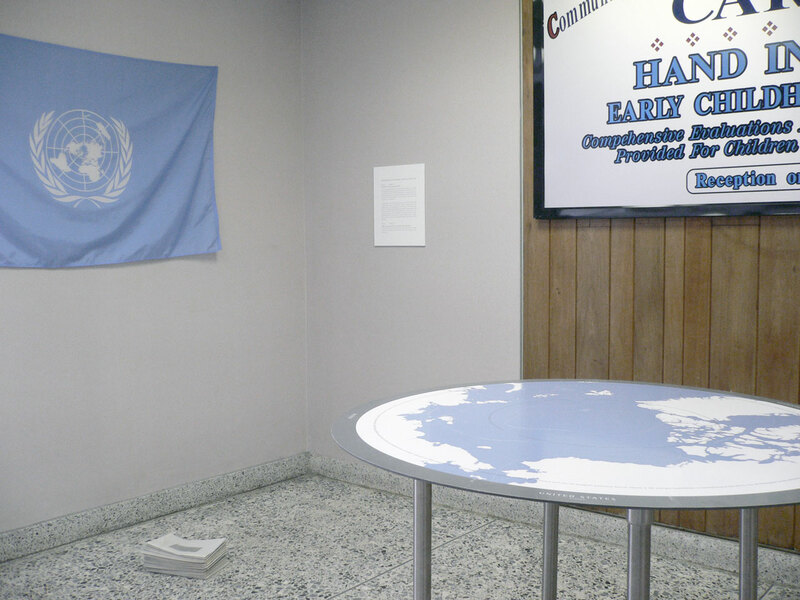 what is at the center of the un emblem? a blank spot that belies the geopolitical realities of the area. this ‘area of detail’, the ice-bound ocean of the arctic circle, is regulated by the un through the law of the sea which sets how nations define and exploit their territorial boundaries. as the climate warms and ice recedes, new possibilities for commerce and capital become possible. this center of the world is becoming a focal point in other ways, as surrounding nations look to claim territory in order to develop new energy resources and commercial routes. 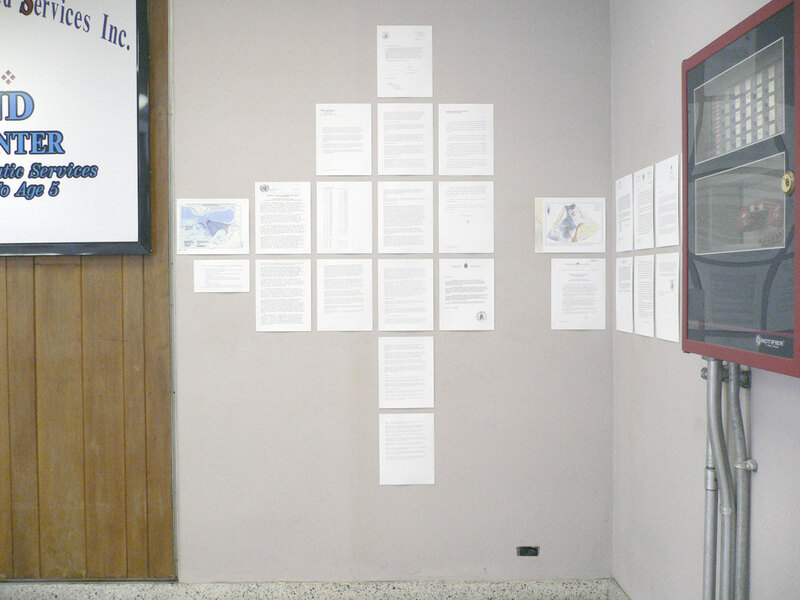 the exhibition was made possible with kind support from the graham foundation for advanced studies in the fine arts.